Do automatic yogurt makers work? If your family eats a lot of yogurt each week, you may have asked that very question. My 4 kids can easily eat 2+ quarts of yogurt each week. For amount of money I spend on 2 quarts of yogurt, I can make 2 gallons of homemade yogurt. 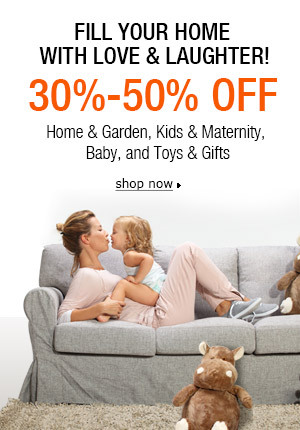 The savings can really add up over time! So it is definitely worth it to look into getting a yogurt maker and making your own each week. Keep reading to learn how electric yogurt makers work and how you too can start making your own yogurt. 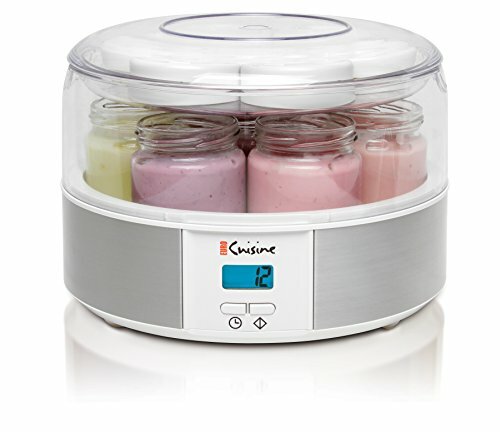 ==>> Click here to see the best deals on automatic yogurt makers. Do automatic yogurt makers work? Despite their name, automatic yogurt makers don’t do all the work for you. What they do (and do well) is provide a consistent warm temperature that makes the perfect environment for the lactobacillus bacteria to grow and multiply. These beneficial bacteria are what gives yogurt its yummy tart taste. Even though they are called automatic yogurt makers, you do have to do a little bit of prep work before you transfer the milk to the unit. It may vary from brand to brand, but typically you have to heat the milk to boiling and then let it cool to about 100 degrees. Then you stir in your starter culture (either powdered or some yogurt that you bought fresh at the store.) This adds the beneficial bacteria to your milk. Then you transfer the milk to your electric yogurt maker and let it do its magic. Eight hours or so later you will have creamy delicious yogurt ready to enjoy. The milk needs to be heated to 185 degrees and then cooled before you add the starter culture. The process of bringing the milk to a boil results in a thicker finished product but unfortunately temperatures that high would kill the beneficial bacteria in the starter culture. It takes about 15-30 minutes to prep the milk before you can put it into the machine. That being said, it really is quite simple to prep the milk for your yogurt machine. Most of the prep time is just waiting for the milk to cool. 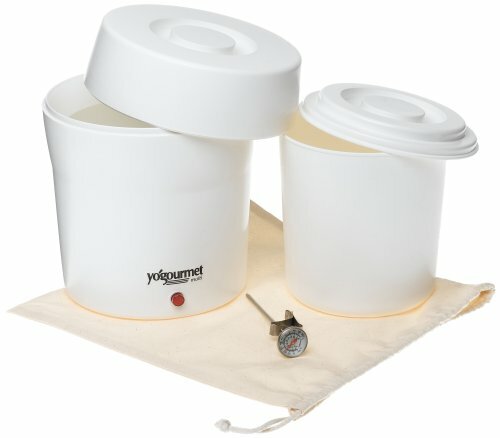 I make yogurt on a weekly basis since I got my electric yogurt maker and would never go back to buying storebought again. We bought a Euro Cuisine Automatic Yogurt Maker a couple of years ago and use it to make yogurt a couple of times a week. We chose this particular model because it comes with 7 glass jars. So you are actually making the yogurt in serving size portions that can go straight from the yogurt maker to the fridge. If you need to make more yogurt before you have used all the previous batch of yogurt, you can purchase another set of the glass jars from Euro Cuisine. I make yogurt twice a week to have to ensure we have enough for the kids to eat it with their breakfast each day. So having another set of glass jars has been a necessity for our family. How much yogurt does the family consume in a week? Do you want a unit that will shut itself off after a certain amount of time? Do you prefer to make individual cups of yogurt? Or would you prefer to make 1 big container of it instead? 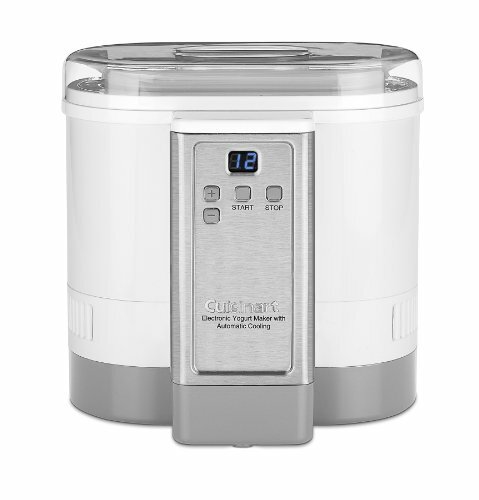 Do you want the unit that will automatically chill your yogurt? Yes they do work, and they work very well! 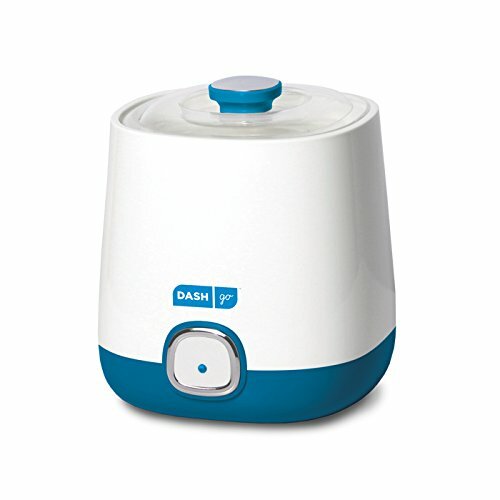 If you or your family eats a lot of yogurt, I think you will find a yogurt maker to be a handy small appliance to have in the kitchen. Not only will you save money in the long run over buying yogurt at the store, but you will also know that your homemade yogurt is made with fresh ingredients without all the added preservatives.